DANA POINT — A mock cannon battle at Dana Point’s Tall Ships Festival turned into reality for one shot, as two women were hit with live ammunition that was reportedly accidentally loaded into one of the ship’s cannons. 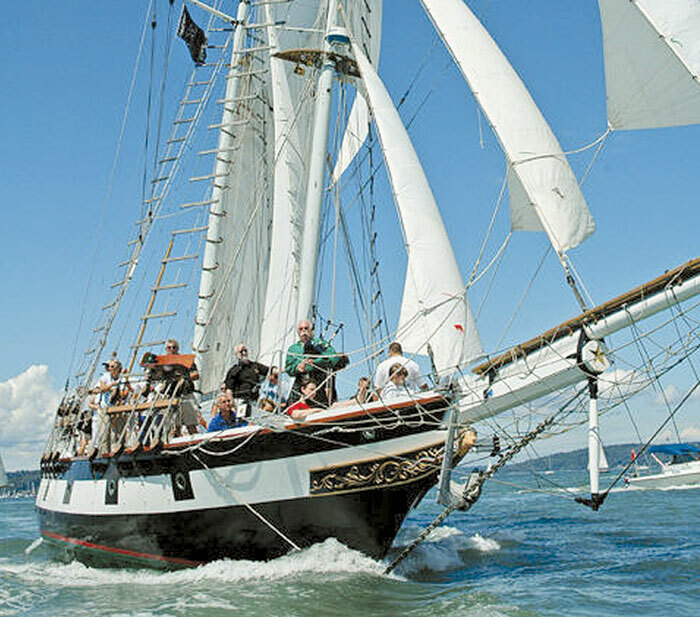 The incident occurred on the evening of Sept. 8 as Amazing Grace, a tall ship based out of Gig Harbor, Wash., was in the midst of a mock cannon battle with the Oxnard-based tall ship Bill of Rights. The battle was running as planned when Donna Reed, a deckhand aboard Bill of Rights; and Laura Huber, a volunteer historical re-enactor aboard the ship; were hit by pellets reportedly fired from Amazing Grace. Both sailors were hit in the legs by the pellets, incurring minor injuries and leaving Reed with five pellets lodged in her skin. Huber reportedly was hit in the arm and leg. After being notified that two passengers had been struck, Bill of Rights Capt. Stephen Taylor maneuvered away from Amazing Grace, and radioed the ship to inform them of the situation on board. The battle immediately stopped, with the ships returning to the harbor. The cannons used in the battle are small in size, about one foot in length. They usually fire off blank 12-gauge shells, but according to reports, a live shell somehow got into one of Amazing Grace’s cannon during the battle. Reed said the cannon’s blank charges look similar to common shotgun shells. Both the Coast Guard and the Orange County Sheriff’s Department is investigating the incident, handling it as a negligent discharge investigation. While speaking with television reporters, Sgt. Mark Alsobrook said the ship’s blank ammunition and the live ammunition were kept in relatively the same area, leading investigators to believe at this point that the incident was a simple mistake. “The plan is to never shoot live ammunition,” Bentley Cavazzi, chief operations officer for the Ocean Institute — which runs the festival — told the Los Angeles Times. Orange County Sheriff’s Department spokeswoman Gail Krause told the Orange County Register her department is awaiting the outcome of an investigation before deciding whether to pursue charges. But Reed, a South Carolina native who recently took a job on the ship as a deckhand and public relations rep, said that regardless of the reason, she and Huber hold no grudge against the crew of the Amazing Grace. In fact, one crewmember is a nurse who was the first to help them. Jonelle Yamasak of the Ocean Institute, which has organized the annual Tall Ships Festival for 28 years, said there has never been an incident like this in the history of the event. “At this point, we are very thankful that injuries were minor,” she said. — Reports from the Associated Press and The Log staff were used in this article.